Immunocastration is an alternative to surgical castration that is based on the arrest of the testicular function by inducing an immune response against hypothalamic or pituitary hormones. Immunocastration reduces the levels of fat androstenone and skatole and thereby, the incidence of boar taint (Bonneau et al., 1994). Vaccination with Improvac reduces boar taint without affecting the meat quality (Gispert et al., 2010). The method has been permitted in the EU since 2009. Immunocastration is carried out on a high proportion of male pigs in Australia (EFSA, 2004). Immunization of young intact male pigs against GnRH with Improvac(r) has been shown to decrease the weight and size of the testes and bulbourethral glands (Zamaratskaia et al., 2008). 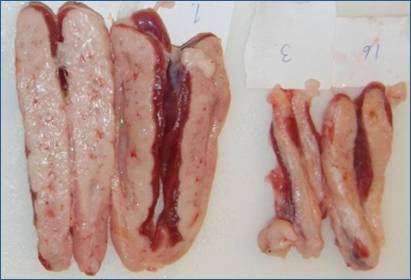 Appearance of the testis of entire male pigs (left) and immunocastrates (right). Source: Ulla Schmidt. Bulbourethral glands from entire male pigs (left) and immunocastrates (right). Source: Carl Brunius. Vaccination with Improvac(r) has also been shown to reduce aggressive behaviour (Cronin et al., 2003) and to result in the same behaviour as in castrates (Rydhmer et al., 2010) and higher growth properties than entire male pigs (Zamaratskaia et al., 2008). Public attitudes to immunocastration and its consequences on the welfare of pigs are as yet largely unknown, and there is a particular need to conduct studies, in total independence of the vaccine manufacturers (Bonneau, 2009). In a Norwegian study based on a survey and focus group studies, most meat consumers were sceptical about immunocastration (Fredriksen et al., 2010). The scepticism was mainly based on the fear of residues. The acceptability of the procedure among Europeans needs to be investigated further. The pros and cons of immunocastration are summarized in the table below. Table 2. Positive and negative considerations of immunocastration.